Challenge and engage your students with these wonderful resources! 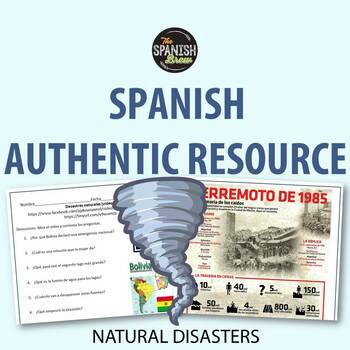 This bundle includes 2 activities: interpretative reading and interpretative listening (video).The first activity includes questions to an authentic resource (info graphic) about a historic earthquake in Mexico City. The second one corresponds to a video about a drought in South America. 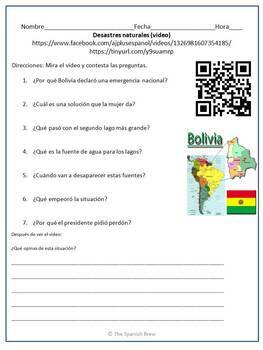 This activity is targeted at Spanish 2 or higher students and will challenge them to extend their knowledge of "natural disaster" vocabulary to a higher level of analysis. Fantastic resource to pair with teaching of preterite and imperfect! Handout includes a copy of the info graphic as well as a QR code. Teacher answer key included. The documents are in Spanish.